Everton saw their slim hopes of qualifying for next season's Europa League ended by a resolute Stoke side. Phil Jagielka's 72nd-minute header seemed to have won the points and extended their challenge by at least 24 hours but it was ruled out for offside. Everton edged a tight, but often dreary encounter, devoid of clear chancers and lacking in real quality. But Stoke's Rory Delap wasted the best opening of the match, somehow firing wide with the goal at his mercy. Delap's miss came seconds into what turned out to be a vastly improved second period. 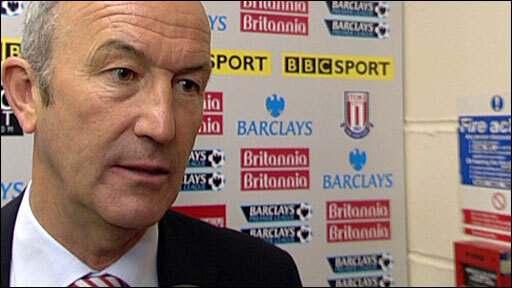 Potters boss Tony Pulis admitted his side were "lucky to get nil" in the 7-0 drubbing dished out by Chelsea at Stamford Bridge last Sunday. And a miserable afternoon on the pitch was further compounded the following day when a dressing-room bust-up involving Glenn Whelan and captain Abdoulaye Faye became public knowledge. But although the call for a "sanctuary of togetherness and solidarity" behind closed doors at least provoked a much more disciplined display against David Moyes' Europa League hopefuls, the fare served up in the first half was uninspiring to say the least. The home edged possession and created the best chance, Ricardo Fuller poking an effort tamely into the arms of keeper Tim Howard following a Mamady Sidibe flick-on. There were also strong claims for a penalty when Mikel Arteta clumsily jumped into Glenn Whelan, and almost inevitably a couple of long Rory Delap throw-ins could have easily led to a goal. In-form Everton seemed strangely subdued and lacking both fluency and urgency. They played competently enough but did not look like a side who - Manchester United apart - boast the best record in the Premier League in 2010. What little threat they did pose came from the recalled Victor Anichebe. Twice the big striker showed a good touch on the edge of the box but one effort was easily fielded by keeper Asmir Begovic and the other went a couple of feet wide of post. The only other noteworthy chance of a pretty dismal 45 minutes saw Anichebe involved in a defensive capacity at the wrong end, blocking a thumping goalbound strike by Leighton Baines. The second half started in much more promising fashion and some swift interplay on the left saw Sidibe find Etherington who slid the ball invitingly across the box for Delap. But despite having oodles of time and no defender anywhere near him, Delap sidefooted miserably wide from 12 yards. Everton responded and began to play much more like the side who were unbeaten in nine games heading into the match. They had their own strong shouts for a penalty when Anichebe went over under pressure from Ryan Shawcross and Anichebe also curled a glorious 20-yard effort inches wide. And they thought they had snatched the points late on when Jagielka's superb downward header from Arteta's corner beat Begovic only to be ruled out because Anichebe was stood in an offside position. Moyes was furious but replays showed the frontman was bang in front of Begovic and clearly interfering with play. And although Everton equalled their Premier League club record of 10 games unbeaten - set between April and September 2006 - the result ended their chances of sneaking into seventh spot. 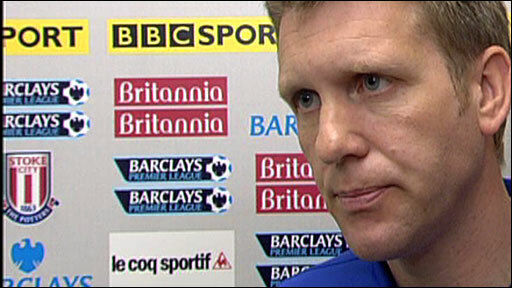 "It was great response [to the 7-0 defeat at Chelsea] because Everton are a real top team. "We played well today. It was real open game, they have good strength and good players who can play. It was a great result. "Their record since Christmas is as good as anyone; we were playing a form team. It was going to be really tough and the response was fantastic. "If you take the Chelsea game away we have been as good as anyone away. We had our backslides slapped last week but they are one of the best teams in the world." "We thought it was a perfectly good goal. We cannot quite understand why it was disallowed. But the officials made the decision and we have to respect that. "He (Anichebe) is in an offside position but is he interfering, I don't know. We have taken a corner and it has been headed straight in the net. "We are very disappointed as we wanted to win today to keep the pressure on. We felt after Stoke's defeat last week they would be in an aggressive mood and determined to show everyone it was a one-off. "We were hoping to take control of the game in the last 30 minutes but unfortunately we could not quite do it." 90:00+2:42 The referee signals the end of the game. 90:00+0:15 Substitution Diniyar Bilyaletdinov on for Victor Anichebe. 89:05 Liam Lawrence takes a shot. Tim Howard makes a save. 88:24 The ball is sent over by Danny Pugh, Joseph Yobo makes a clearance. 86:39 Substitution Rory Delap goes off and Danny Pugh comes on. 86:39 Substitution Tuncay Sanli is brought on as a substitute for Mamady Sidibe. 86:39 Substitution Liam Lawrence replaces Matthew Etherington. 85:56 The offside flag is raised against Danny Higginbotham. Phil Jagielka takes the free kick. 85:25 Jack Rodwell takes a shot. Blocked by Glenn Whelan. 83:37 Corner taken by Glenn Whelan, Robert Huth takes a shot. Save by Tim Howard. 82:20 Corner taken right-footed by Glenn Whelan. 81:33 Corner taken by Matthew Etherington. 78:18 Victor Anichebe takes a shot. Glenn Whelan gets a block in. 77:08 Effort on goal by Ricardo Fuller from just outside the penalty area goes harmlessly over the target. 76:13 The referee blows for offside. Indirect free kick taken by Asmir Begovic. 73:50 Victor Anichebe is caught offside. Asmir Begovic takes the free kick. 73:04 Outswinging corner taken from the right by-line by Mikel Arteta. 72:50 Jack Rodwell takes a shot. Blocked by Robert Huth. 72:36 A cross is delivered by Ricardo Fuller, Tim Howard makes a save. 71:12 Substitution Jack Rodwell comes on in place of Leon Osman. 71:12 Substitution Ayegbeni Yakubu joins the action as a substitute, replacing Louis Saha. 70:46 Shot from outside the box by Victor Anichebe goes wide right of the target. 69:59 The ball is crossed by Phil Jagielka, Shot from 12 yards from Victor Anichebe. Save made by Asmir Begovic. 67:09 Phil Jagielka produces a cross, Danny Higginbotham makes a clearance. 66:13 Leon Osman takes a shot. Asmir Begovic makes a save. 65:01 Mikel Arteta fouled by Mamady Sidibe, the ref awards a free kick. Mikel Arteta fires a strike on goal direct from the free kick. 62:24 Victor Anichebe fouled by Andy Wilkinson, the ref awards a free kick. Free kick taken by Mikel Arteta. 61:40 Ryan Shawcross fouled by Louis Saha, the ref awards a free kick. Ryan Shawcross restarts play with the free kick. 60:34 Ricardo Fuller produces a left-footed shot from just outside the area that goes wide left of the goal. 59:22 Glenn Whelan crosses the ball, clearance made by Phil Jagielka. 57:21 Free kick awarded for an unfair challenge on Ricardo Fuller by Leighton Baines. Glenn Whelan produces a shot on goal direct from the free kick. 55:22 Long distance shot from Glenn Whelan misses to the left of the net. 54:40 Foul by Victor Anichebe on Robert Huth, free kick awarded. Asmir Begovic takes the free kick. 54:24 Centre by Leighton Baines, Robert Huth makes a clearance. 53:26 A cross is delivered by Ricardo Fuller, clearance made by Phil Jagielka. 49:42 Leighton Baines crosses the ball. 47:10 Matthew Etherington delivers the ball, Effort on goal by Rory Delap from deep inside the penalty area misses to the right of the target. 45:00+1:28 The half-time whistle blows. 45:00+0:58 Mamady Sidibe gives away a free kick for an unfair challenge on Tim Cahill. Phil Neville takes the direct free kick. 42:09 Centre by Matthew Etherington. 41:43 Corner taken by Matthew Etherington from the right by-line, clearance made by Sylvain Distin. 41:25 The ball is delivered by Victor Anichebe. 39:17 Corner taken right-footed by Mikel Arteta from the left by-line, Louis Saha concedes a free kick for a foul on Danny Higginbotham. Asmir Begovic takes the direct free kick. 38:58 Victor Anichebe takes a shot. Andy Wilkinson gets a block in. 38:51 The ball is sent over by Mikel Arteta, clearance by Ryan Shawcross. 38:39 Leighton Baines takes a shot. Blocked by Robert Huth. 38:15 Leighton Baines decides to take a short corner. 36:11 Free kick awarded for a foul by Mamady Sidibe on Tim Howard. Direct free kick taken by Tim Howard. 34:25 Effort on goal by Glenn Whelan from outside the box goes harmlessly over the bar. 33:14 Effort from outside the box by Victor Anichebe goes wide right of the target. 32:20 Free kick awarded for a foul by Victor Anichebe on Danny Higginbotham. Danny Higginbotham restarts play with the free kick. 29:34 Joseph Yobo challenges Ricardo Fuller unfairly and gives away a free kick. Direct free kick taken by Matthew Etherington. 28:33 Rory Delap delivers the ball. 27:41 The ball is delivered by Andy Wilkinson. 26:58 Andy Wilkinson fouled by Leon Osman, the ref awards a free kick. Asmir Begovic takes the free kick. 23:53 Ricardo Fuller concedes a free kick for a foul on Phil Jagielka. Direct free kick taken by Tim Howard. 23:36 The ball is sent over by Dean Whitehead, clearance made by Phil Jagielka. 22:58 Foul by Joseph Yobo on Mamady Sidibe, free kick awarded. Glenn Whelan restarts play with the free kick. 21:29 Ricardo Fuller takes a shot. Tim Howard makes a save. 21:06 Victor Anichebe takes a shot. Save made by Asmir Begovic. 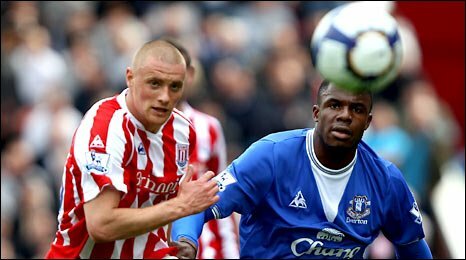 20:39 Andy Wilkinson gives away a free kick for an unfair challenge on Victor Anichebe. Mikel Arteta takes the direct free kick. 19:44 Header by Ryan Shawcross from deep inside the penalty area misses to the left of the target. 18:18 Inswinging corner taken right-footed by Mikel Arteta, save by Asmir Begovic. 17:34 A cross is delivered by Mikel Arteta, clearance by Robert Huth. 15:20 Foul by Louis Saha on Robert Huth, free kick awarded. Danny Higginbotham takes the direct free kick. 13:52 Centre by Phil Jagielka. 12:08 Dean Whitehead takes a shot. Blocked by Phil Neville. 11:56 Ryan Shawcross takes a shot. Joseph Yobo gets a block in. 11:26 Corner taken right-footed by Glenn Whelan to the near post, clearance made by Phil Jagielka. 9:54 A cross is delivered by Ricardo Fuller, clearance made by Phil Jagielka. 8:50 Mamady Sidibe challenges Leighton Baines unfairly and gives away a free kick. Mikel Arteta takes the free kick. 7:11 Inswinging corner taken from the right by-line by Matthew Etherington. 5:59 Foul by Dean Whitehead on Mikel Arteta, free kick awarded. Direct free kick taken by Joseph Yobo. 4:44 Danny Higginbotham fouled by Leon Osman, the ref awards a free kick. Asmir Begovic restarts play with the free kick. 3:31 Mikel Arteta fouled by Mamady Sidibe, the ref awards a free kick. Sylvain Distin restarts play with the free kick. 2:33 Unfair challenge on Mikel Arteta by Glenn Whelan results in a free kick. Mikel Arteta takes the direct free kick. 0:15 Corner crossed in by Mikel Arteta.